Mrs. Katherine L. "Katie" (Pulver) Surdam, age 61, of rural New Hartford was born August 8, 1882 in Copake, New York, daughter of New York natives Mary E. and John Pulver. 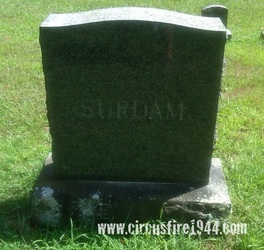 She was found dead at the circus grounds after the fire on July 6 and was buried at the Bakerville Center Cemetery in New Hartford after services at the Shea Funeral Home. 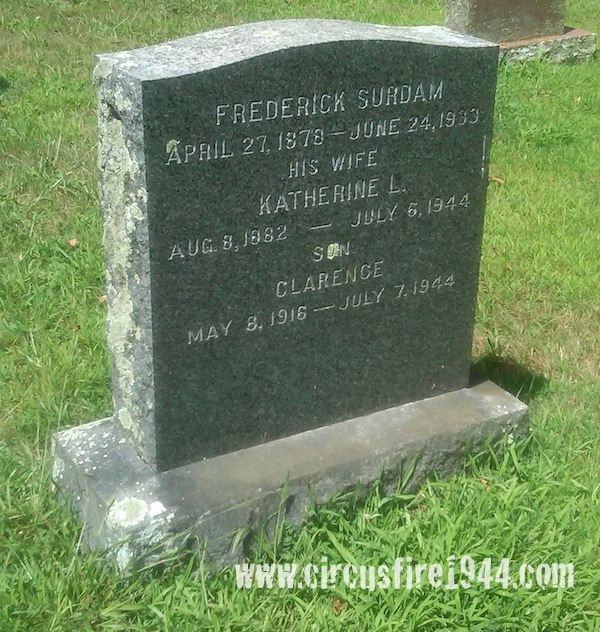 Katherine's late husband, Frederick Surdam, Jr. died in 1933 at age 55, and their son Clarence, 28, was also a victim of the circus fire. Mrs. Surdam leaves a son, Earl Wilbur Pulver, 44; her brothers, John M. Pulver*, 57, Edward Charles Pulver, 67, and George Pulver, 45; and her sister, Sara E. Pulver*, 69. Katherine's cousin Eldoras Bergin attended the circus with the Surdams and also died from injuries received in the fire. Body #2161 was identified as Katherine Surdam at the State Armory on July 7 by a relative. Katherine was in very good health, and wore a brace for a double hernia condition that she suffered at age 13. In addition to housework, she also helped her son run his chicken farm. Mrs. Surdam's estate was awarded $6,500 by the arbitration board. * Need confirmation that John M. Pulver and Sara Pulver were alive in 1944. Not known if Sara was ever married.